Beach promenade walk from Marbella to Puerto Banus – and sail back again! Marbella town has a fantastic beach promenade where you can walk to Puerto Banus in a couple of hours. 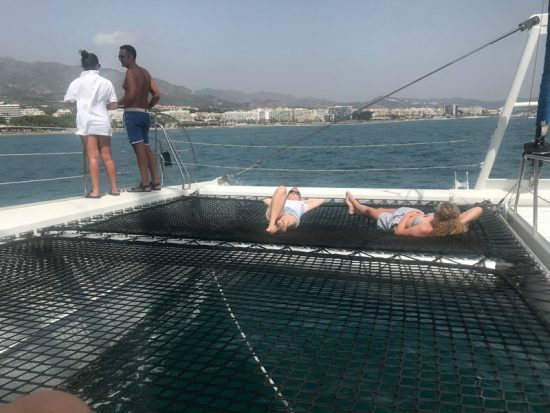 Here’s our proposal for a day trip where you walk from Marbella to Puerto Banus and take a catamaran boat trip back to Marbella again. The walk itself is about 7 km and will take just over 2 hours depending on how fast you walk or how many breaks you take along the way. 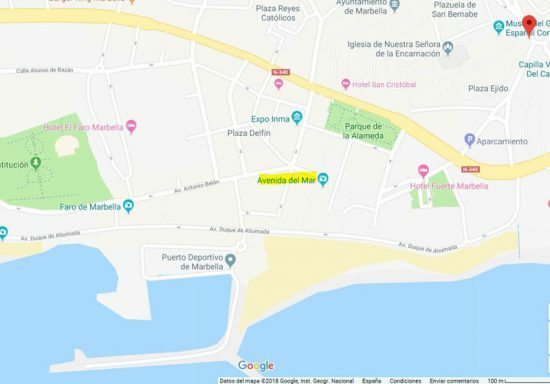 You´ll also have to count on time to see Puerto Banus, if you fancy having lunch there and returning time of the boat trip. So it can easily become a full day excursion. 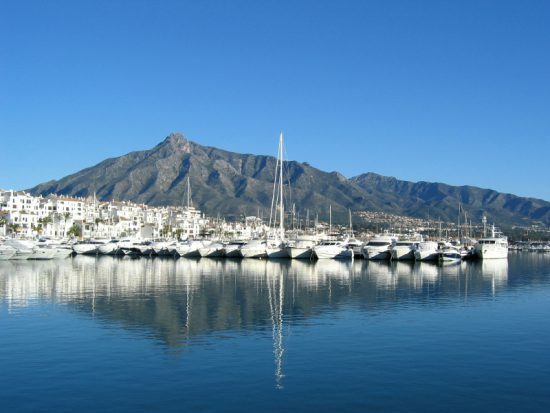 We suggest you start the excursion by driving to the centre of Marbella city. You can park the Helle Hollis car in the underground parking, “Parking Avda. Del Mar “, which is next to the yacht harbour. 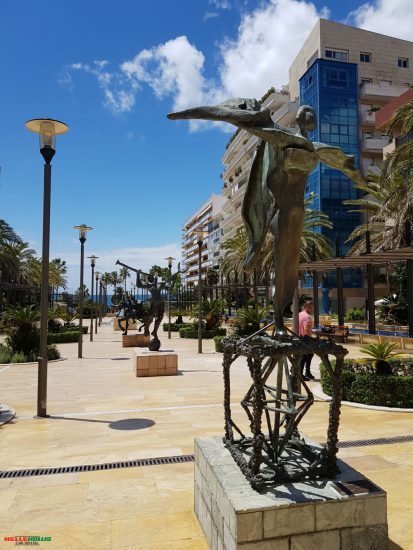 From the parking basement you directly reach Avenida del Mar, where you can see the famous Salvador Dali sculptures, and then continue to the seafront promenade. Here you pass by the marina and continue on the seafront towards Puerto Banus. The first kilometre is on a nice marble promenade, and later on the walk turn into hard-pressed sand / soil. There are many small “chiringuitos” or beach bars along the way, where you can stop and have something cold to drink. You will also pass by beautiful beach villas, and the four – five star hotels Marbella Club and Puente Romano. 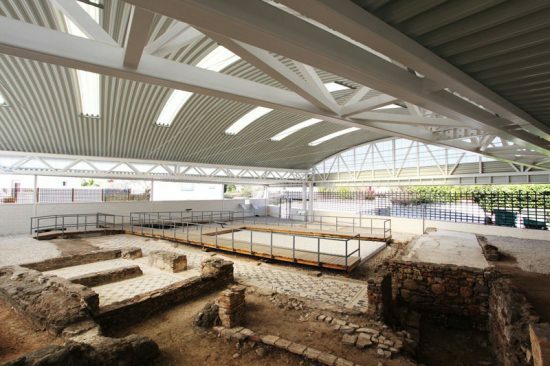 A few kilometres before Puerto Banus, there is sign for “Villa Romana de Rio Verde“, which is archaeological remains of a Roman country house. You only have to deviate a few hundred meters from your walk if you want to visit this place. The entrance is free and it´s open on Fridays, Saturdays and Sundays from 10:30h – 13:30h. Back again on the seafront promenade, you cross a little further on a suspension footbridge, crossing the river “Rio Verde”. After a few hundred meters you have reached Puerto Banus. Puerto Banus is known for the many luxury shops, restaurants and nightlife. There are huge yachts to admire and exclusive cars like Porsche, Lamborghini and Rolls Royce are parked in the harbour. 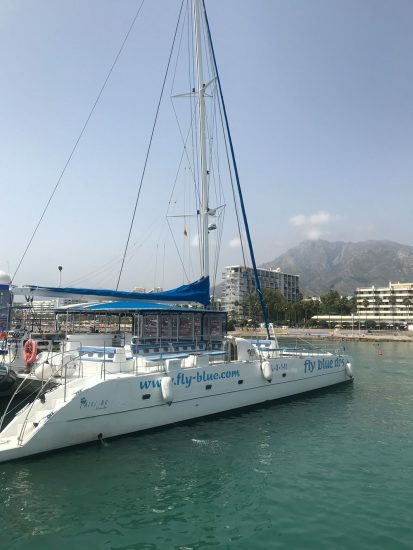 When you are ready to return to Marbella again, we recommend you take the catamaran boat from the company “Fly-Blue”. They depart every hour from Puerto Banus, and the cruise itself takes about 30 minutes. The timetable is subject to changes due to weather conditions. The price for a one-way ticket is 8.50 euros for an adult and 5 euros for children.